I have been chatting back and forth with several forum members lately in the Amplification section about a large church project I have undertaken. I want to be able to have a console that is as light and bare-bones as possible. I don't want the computer, amps, DSP Processors, etc. in the console, but rather in a locked storage room behind the alter. I want the console to be easily moved and fairly "portable" so it can be used anywhere on the alter. My design allows for only 3 cables to be plugged in: 2 shielded Cat6 link cables (one for USB and the other for HDMI), and power. That should be easy enough, eh? My main question: Using this MIDI / USB setup, does anyone have experience doing this sort of thing? Do you have any experience with latency issues in this type of setup? Any relevant input about this aspect of the design? Again, if you have alternate product recommendations, I'm all ears, but please keep sales pitching to a minimum. EDIT: I have lots of experience with the Gefen USB extenders when it pertains to standard USB functions - keyboard/mouse, video, etc. But what I do not know is how well they (or any other USB extender) handle MIDI data in terms of accuracy and speed (latency). have you considered wireless midi? I have a similar set-up to what you are proposing, except mine is in the home. I have my console in one room and the computer and amplifiers in another room. The console has just two cables running to it. One USB and one power. The pictures are out of date showing the computer next to the console. It has since been moved into the next room. 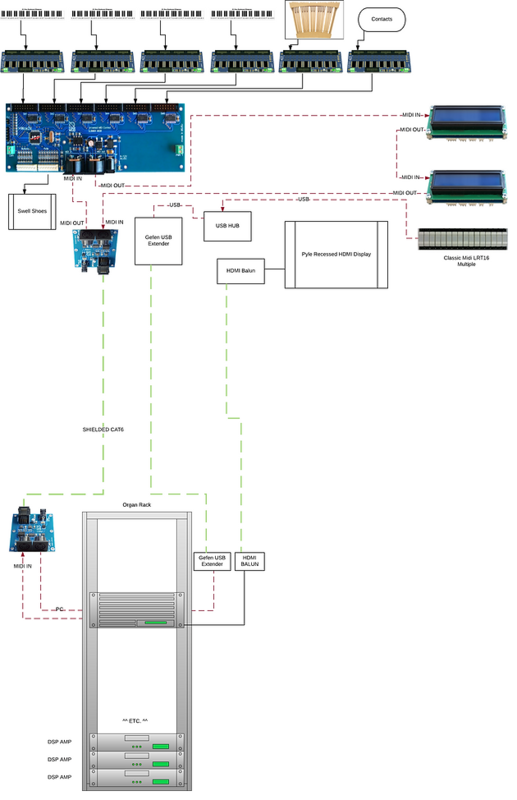 The schematic shows how I hooked mine up. Everything on the left side of the schematic plus the MOTU Microlite is located in the console. So there is just the one USB cable running between it and the computer. Scroll down to see a picture of the two plugs out of the back of the console. My USB cable is only about 10 feet, but the theory should be the same. I have not noticed any latency issues with this setup. Working from my design above, things have changed a bit, since I was able to purchase this Allen 314 console. I will now be using the Allen keyboards, with their original contact system, with the MGB HWCE2x Bundle 1, with the multiplexors. Has anyone used the MGB Midi over RS485 baluns? Does anyone see any issue with this design? Drew - NICE looking Allen!! I've been googling and am at a total loss to find it-- but there is a university somewhere in the US that installed a HW organ in their concert hall. I don't know if the computer is in the console or not but they do have it designed to be mobile and roll to the center of the stage or back stage for practice as well. Perhaps someone can remind us where that installation is? If we can find it you might be able to reach out to that institution to see how they managed the installation. The top manual is a fairly new Allen sourced from eBay. It has a much newer contract strip that I will be utilizing that the other three manuals do not have. I have been toying with the idea of doing away with the old 1960's Allen keying matrices, but part of me wonders if it's worth replacing. If the contacts and wiring are there, why fix what isn't broken? Thoughts? A new face plate is being made by a local woodshop that will cover the sides of the manuals, and the top section above the new manual below the top/music lid. He is CNC routing three windows in it for mini LCD displays to mount. I'm also planning to get three more mini LCDs to identify the three expression pedals, as their functionality will change depending on the loaded organ. The wiring has changed a bit as well. Rather than trying to sum the MIDI and USB's, out of fear of latency, I am going to use the MGB Midi over RS485 for all MIDI traffic, and then the USB for the touch interfaces will be on their own. This keeps the latency (even if there isn't the potential for any) at minimum. My .5 cents worth would be to swap the contacts for optic or reed switches. The old Allen contacts, while designed to be self wiping, will eventually oxidize/corrode and give you grief.